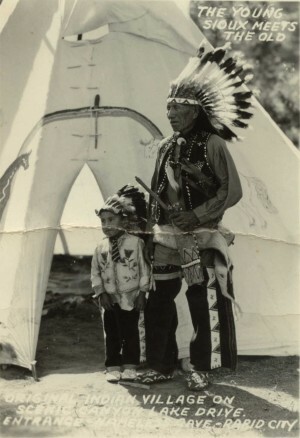 Sioux holy man Nicholas Black Elk is shown with his grandson, George Looks Twice, in this photo that was probably taken in the late 1930s. Admission: General seating is $20 for adults, $15 for children ages 5 to 17, free for ages 4 and younger; reserved tickets are $35 for adults, $30 for ages 5 to 17, free for ages 4 and younger. Call 800-529-0105. The series of festivities begins Friday, July 29, and continues for three more weekends on the college’s administrative campus near Kyle. 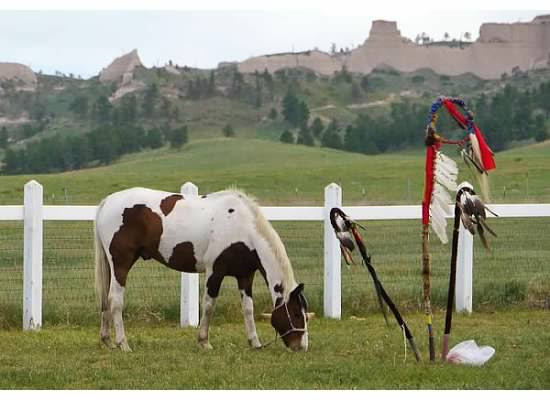 Beginning at 3:30 p.m. each Friday and Saturday through Aug. 20, there will traditional Oglala hands-on activities including an art market, archery, games, beading and porcupine quill work, face painting, quilting, storytelling, dance and drumming. There is no charge for the afternoon activities. A traditional Oglala meal will be served at 4 p.m. for $10. Doors will open for the showing of “Black Elk Speaks” at 6:30 p.m. at OLC’s multi-purpose building. Actors and actresses include OLC students, staff and community members. The play is based on the 1932 book of the same name by Nebraska poet John G. Neihardt, taken from his conversations with the Oglala holy man Nicholas Black Elk, who lived from 1863 to 1950. Black Elk said that several times during his life, he had several visions in which he learned things that would help his people. In the book, he reveals the story of his life, including his experiences at the Battle of the Little Bighorn and the Wounded Knee Massacre, and tells of Native American tribal traditions and spirituality. During the Oglala Cultural Experience, the OLC Historical Center will stay open until 6:30 p.m. for visitors. The center contains a display of art and photographs that chronicles the history of the Oglala Lakota from the early 1800s to the Wounded Knee Massacre in 1890.OLC also hosts the Summer Artist Series at the Historical Center, promoting awareness of the arts of the Oglala Lakota on the Pine Ridge Reservation and the surrounding area. The series features 12 artists each summer. 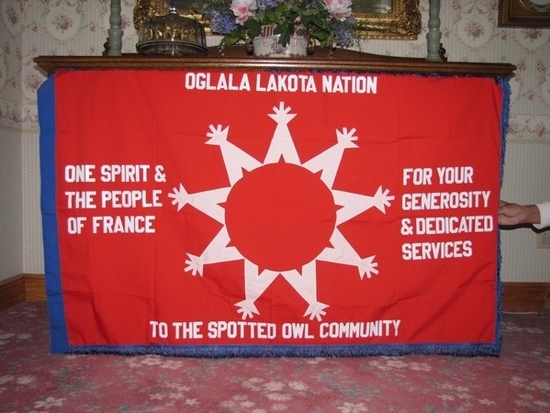 “This is a first for OLC, and we are excited about the event giving us the opportunity to expose the general public to the culture and traditions of the Lakota and to educate them on the deep history of the Oglala Lakota through the photos in the Historical Center,” Thomas Shortbull, president of Oglala Lakota College, said in a news release. “We hope to bring tourism to the Pine Ridge Reservation to expand the market for the Lakota artists, to bring national recognition to the artists, and to inspire many talented Lakota to pursue their talent in the arts,” he said. All events will take place at OLC’s powwow grounds and the multi-purpose building at the Piya Wiconi Administrative Campus, located seven miles southwest of Kyle. For more information, call Shortbull at 455-6022 or Marilyn E. Pourier 455-6045. Copyright 2011 Rapid City Journal. All rights reserved. This material may not be published, broadcast, rewritten or redistributed. You find, in chronological order (from newest to oldest) some of the programs that we have made. Compte tenu de l'augmentation des prix, nous envoyons désormais $1300 par mois, permettant aux 24 filleuls de bénéficier d'un panier alimentaire. Suite à une demande urgente concernant des dizaines de familles en besoin de nourriture, nous envoyons $1500 permettant d'acheter 30 paniers alimentaires. Mais là encore, les beoins sont énormes et toute aide sera la bienvenue. What can I say? There just aren't adequate words to express ou appreciation for your wonderful giving hearts. It is wonderful that you people are so kind. It brings tears to my eyes. Thank you. We have received the donation of $1500.00 through PayPal. Bless you!!! Comme chaque mois, les 24 filleuls ont bénéficié d'un panier alimentaire pour une valeur de $1040. Nous avons réglé une facture d'électricité de $379, afin d'aider une mamie qui ne pouvait s'acquitter de ce montant. Une fois n'est malheureusement pas coutume, et comme le mois dernier, nous avons souhaité qu'une quarantaine de familles figurant sur une liste d'attente, puissent bénéficier d'un panier majoritairement alimentaire. et ci-dessous les remerciements de notre partenaire aux USA. families on the waiting list. Bless you!! Fidèles à nos 24 filleuls :-), nous leur faisons parvenir, comme chaque mois, un panier alimentaire, s'inscrivant dans le programme "share food" et ce pour un montant de $1040 . Envoi de $1800 permettant à une quarantaine de familles lakota, inscrites sur une liste d'attente, de bénéficier d'un panier principalement alimentaire. The love, kindness, and generosity you show our Lakota brothers and sisters is sincerely appreciated. The $1,800.00 you sent through PayPal to be used for food for other families on the waiting list is such a blessing. Thank you!!! Dans la continuité de notre participation au programme nourriture, nous envoyons $1040 permettant à nos 24 filleuls de recevoir un panier alimentaire. The food you provide for the people you sponsor means so much to them. I am sure the new sponsored for February will be grateful as well. Thank you doesn't seem sufficient, but THANK YOU!! I had Cheryl in chat yesterday evening. She confirmed me she has received the delivery of propane. $1000 sent (for a food aid) to our 23 sponsored by our members and the association. Thank you as always for your continued support. On behalf of those sponsored and the staff of ONE Spirit we express our deep appreciation for your kindness. The $1,000 we received through PayPal is sincerely appreciated. $1000 sent to buy warm clothes for the children of Donna and Bill . $1000 sent for food help to the benefit of our 23 sponsored children and elders. "We have been notified that there are still 20 families in need of food. It is our hope that we can help brighten their holidays by ensuring that they are able to receive the nourishment that they need. There is still time to place your order and give the gift of nutrition this holiday season." So we sent $1000 allowing these families to get a food help. "Thank you for the $1000 we have received for the food program for the families on our waiting list. PRES is doing great things for the Lakota and for Pine Ridge!" During the last 5 years, the men of the sector of Allen (Pine Ridge rezervation) cut, collected and delivered wood to the elders and families' houses . Pine Ridge is the poorest sector of the Western Hemisphere (except Haiti) and every year during snowstorms with negative temperatures, houses are without heating. Here, where the unemployment is more than 80 %, this wooden program allows the men to gain some dollars and to deliver wood to the families. The elder sons(brothers) and families receiving the wood, help them by supplying them a small quantity of gas. One Spirit pays to the men 100 $ a wooden load and supplies them the necessary equipment. During the snowstorms on the reserve, these men delivered the wood to the families without heating. They have only a chain saw and they need two others to collect enough wood and deliver a maximum of houses. Our association paid $275 to buy 2 more chain saws. 2 new sponsored children! We now help 23 children and elders. 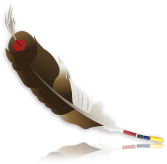 Monday 6: $100 sent to the Lakota association Tusweca Tiospaye which is a on-profit organization dedicated to the promotion and strengthening of the Lakota language by offering classes and events and developing teaching materials . Tusweca Tiospaye organizes a seminary in the town of Rapid City on november 18-20 th. This seminary is titled: 2010 Lakota Dakota Nakota Language Summit :"Uniting the Seven Council Fires to Save the Language." Thursday 9: $920 sent . We are expecting new godchildren. 21 children and elders are sponsored by the members and the association. Held account that 2 godchildren benefit each of 2 food baskets, we sent this month an amount of $920. The wooden deliveries are made by an Elder Lakota who goes through the reserve with its truck to deliver the families. The Truck manhandleddeformed by the bad weather, gave up the ghost. Its replacement required to find $8000. Our association was contacted to participate at the level of $2000. The money was found, thanks to donors and to various artists (sculptors, painters, ceramists) participating in the exhibition taking place at the end of June in Montreuil -sur-mer. We sent $ 2000 and the truck has been bought.The deliveries will start again this winter . Further to a call(appeal) of a family in distress, relieved by our partners of One Spirit, we sent 350 to participate in the payment of a rent, avoiding a couple and his baby to live outside. Besides Marian and Dennis, 19 godchildren are now sponsored by our members for a $890 amount. Marian and Dennis have received a Classic Package . $ 770 sent for our 16 sponsored chidren concerned with the Food program. The 17 th child has gone to Rapid City and he will be personaly helped by his sponsors. 2 more persons have received a "Classic package" too. $100 for Marian and Dennis. $1500 sending for deliveries of propane and wood for the Lakota families. One Spirit is in receipt of your donation in the amount of $1500 for wood and propane. On behalf of those who will benefit from the heat for their homes and One Spirit we thank you for your continued support and generosity. $1320 payment for propane or wood delivery for 10 families .Below the e-mail of thanks of our partner, the American One Spirit association. Payment of propane ($150 ) for a 86-years-old grandma, Emma, living in Wanblee. We wait for the confirmation to make deliver 10 families with propane or wood. For January, the FSA (Food Share America) suspended its deliveries in the South Dakota. This body supplies with the food that we use within the framework of the program " Share ". Consequently for February, the godchildren will receive 2 baskets of food. Within the framework of a youth aid program , we have purchased presents and candies (for 2500) for 100 kids to bring them a little of comfort in this holiday period. Within the framework of the heating program in which we participate, we paid an electric convector, to a lakota grandma who will be delivered on Saturday. To help the family of Bill and Donna Jumping Eagle, we have, as expected, bought 4 tents of 4 persons, conceived for the big colds, for $1352 . These tents will be very useful to the young people when they will participate to the " camp horse " and the Big Foot Ride, on the end of December. It's hard to find an all-season tent that is able to accommodate a family or even a couple friends, and that's why we're offering our XPG™ Expedition 4-Season Tents in two-, four- and six-person models. Reinforced continuous pole sleeves rigidly hold a DAC 7001 T6 aluminum four-pole frame so these tents can stand up to heavy snowfall, violent wind, pounding rain and sleet. The tent bodies are constructed of rugged, 70-denier 190T taffeta nylon for seasons of service in the most demanding terrain and weather. We constructed the rain flies of polyester because it has superior UV resistance, and then treated them with a 1,500mm waterproof-rated coating to lock out the elements. The two doors on the flies have accompanying vestibules and dual two-way zips with snagproof cording for easy ventilation. Clear windows give you good visibility, and shrouded mesh vents allow air to move through the flies while keeping out moisture. Inside each tent, you'll find an organizer panel to keep your equipment and personal items off the ground. Highly visible reflective guy lines prevent trip-ups in low light. Tub-shaped floors afford maximum protection from the elements. Heavy-duty extruded-aluminum stakes are included. Heavy-duty YKK® zippers with snagproof zip cording are used throughout. $440 sent on the program of sponsoring, allowing every person or family to benefit from a food basket of fresh products.. Thanks to the support of 2 of our members,$ 80 sent to help a family; ( program "food") . $50 sent allowing to 2 families to benefit from the program share (food). To help the family of Bill and Donna Jumping Eagle, we have just bought 15 sleeping bags and 15 braids for a total amount of $ 1236 .The purchase was made in the store Sierra Trading . We send 300 for the purchase of a pressurized reservoir allowing a family of the reserve to obtain some water in her house. Thanks to an eleventh sponsor, we sent $440 on this program of sponsoring. $80 sent , thanks to the help of 2 of our members supporting a family from now on more than year. $50 sent allowing to 2 families to benefit from the food program. Thanks to the participation of a 9th sponsor, $360 have been sent to offer the children a food basket. $80 sent to support a family of the reserve . $50 sent to support 2 families (Share program ). Thursday, 10: within the framework of the help attributed(awarded) to Bill and Donna Jumping Eagle, one of our members sent them a parcel containing warm accessories (Caps, gloves, blankets and baby clothes). Thanks to a 10th sponsoring, by one of our members, $40 have been sent for the food support. After the death of Victoria Chipps , Lakota leader and grandmother of one of our contacts lakota, our association sent $120 for participation to the funeral ceremony . This money was sent to Kyle grocery, store supplier of this event. Following information provided by our partner, One Spirit, we wish to provide special assistance, to Bill and Donna Jumping Eagle. 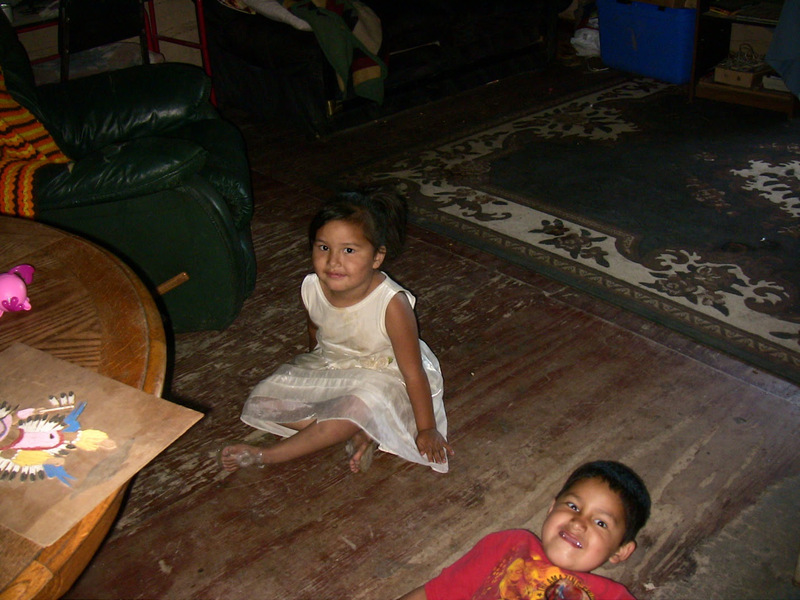 Indeed, this pair of Lakota has created a "safe house" (safe house) for 17 young Lakota in great difficulties. They provide food, shelter and clothing, paid their own money. They enseignernt methods and traditional values of culture lakota. These young Lakotas attend school and are left out of drug problems , alcohol, and gangs. Apart from these 17 children, Billy and Donna are working with other adults Lakotas to design a therapeutic camp based on horses and 50 for adolescents at high risk of being faced with drugs, alcohol, and gangs. This camp will also be a way to fit, responsible, make them stronger to face the difficulties of life, all this in a spirit of adventure, fun and discovery. PRES fully supports the programs initiated by the Lakota. These programs, are essential for all children and adolescents who desperately need food, housing, care, clothing ... and love! As part of assistance to Bill and Donna Jumping Eagle, we sent a 2nd $ 500 donation to support all these kids. A big thank you to the donors ! $350 have been sent for the sponsoring 8 children and elders. After sponsoring 7 Elders, a couple of our members are sponsoring a little boy in a family in great difficulty. $ 320 that have been sent for this program. 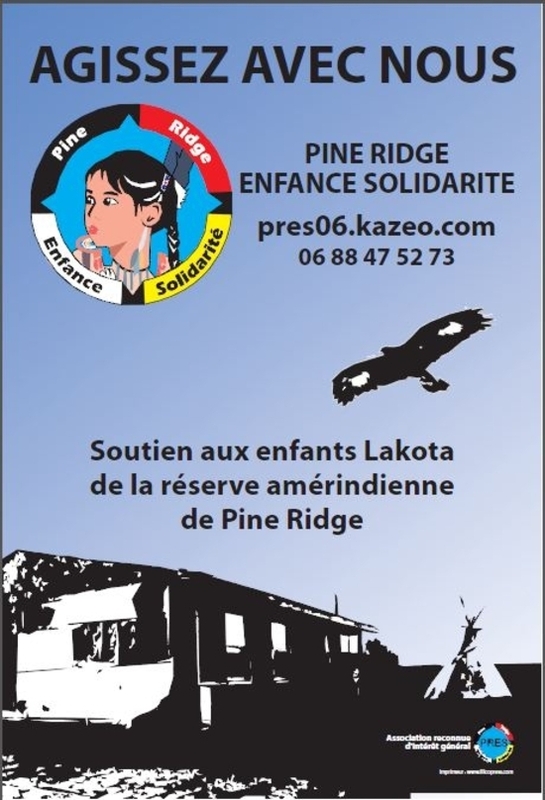 Our association sent $1300 to participate financially in Youth Ride ( Program "horse") and from which benefit the lakotas young people of the reserve of Pine Ridge. Sending $ 1075 for the purchase of 25 electric convectors. These are + or - 250 people who will benefit from this program. Sending $ 500 under the program Okin. This allows families to benefit from property. (Beds, home furniture, sheets, blankets etc.).. 2 families are helped through the food program. February 12: Sending $ 1,000 for the heating. Supported by nearly 2 families through the food program. 7 members of PRES sponsor 7 Elders of the reserve. Friday 9: sending $ 800 for the delivery of 20 electrical appliances to several families of the reserve. Monday 5: Following the delivery of propane at the house of local ceremonies and to save fuel, we paid 2 electric convectors that will allow some elders to enjoy a little heat. Monday 22: sending $ 1500 for participation in our programs to deliver food and heating (wood, propane, gas or electric convectors). Saturday 20: sending $ 250 to 10 to allow Elders to receive a food basket. Saturday 06: 2nd $ 125 delivery of propane for the local home ceremonies, cotoyé by Elders Clan Lake Wakpamni Dennis Yellow Thunder. Wednesday 03: Delivery of first $ 125 of propane for the local home ceremonies. Wednesday 19: As expected, sending $ 1500 to enable families to support food and heating (wood, gas, propane). Wednesday 12: Following the snowstorm that hit hard, among other things, the reservation in Pine Ridge, engaging our members and contacts that allowed a first sending $ 1300 financial programs for food, wood, gas and propane. A 2 nd shipment is expected at the end of the week ... and will be followed by others throughout this winter. But this can be achieved with the assistance of everyone wishing to assist the Lakota people. 11 and 12 October: PRES members general meeting in Lyon. 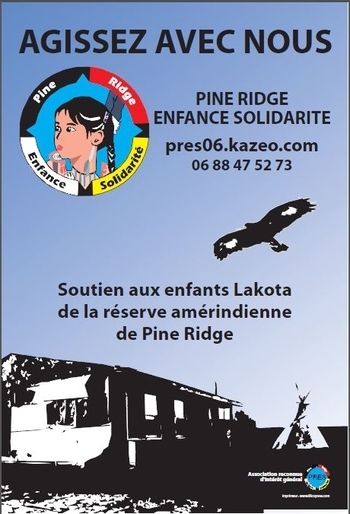 A big thank to Maryline friendly president of the association "L'Esprit vert" (Green Spirit) who organized in her city of Montreuil sur Mer a beautiful day on the American theme of helping children of the Lakota Pine Ridge reservation. This day of 21 September had been preceded by an opening, for which fifteen artists from the region had produced works which will be sold to the benefit of our association. These unknown friends are thanked for their participation. - PRES was present at the Country festival of Castelnau D'estrefonds 30 and 31 August . Our friendly member, Sonia, was behind the stand of our association. The money recovered will be returned to the full realization of our programs. - Visit of the reserve by a future member of our association, with one of our contacts Lakota, with delivery of more than 50 kgs of clothing, material para-pharmaceuticals, school supplies. - 7 members of PRES sponsor 7 Elders of the reserve. - Preparing the winter of our program: the supply of electrical appliances. A very nice program for which we invite you to join us. - 2 families are helped through the food program. - School Chazelles Lyon again in the spotlight with a friendly participation of its students who has raised 76 euros for our programs. They are thanked! A big thank you to our member who Arno activity has raised 290 euros and 2 memberships in our association. - Payment of $ 800 for the food program. - Monthly support to a family with 2 of our members. - 1200 were sent to allow a maximum of Lakota youth to participate in this event which will be a highlight of their lives. - 7 members of PRES sponsor since October 07, 7 Elders of the reserve. - Throughout the month of February, delivery of 18 families (of different areas of the reserve) in electric heaters. - Delivery of 55 gallons of propane for the local home ceremonies in the south of the reserve. As expected, early support to the family we delivered toys to children for Christmas. This is achieved through our participation in Share. As part of our partnership with young artists from the Rez, (Buffalo Children Society program), we have purchased 5 new drums that are for sale! Today. As before, the proceeds from the sale of this craft will be fully refunded for this program. CONFIDENTIALITY All identifying information or photos of families, children, and elders is confidential. Identifying information includes names, addresses, telephone numbers, and descriptive information that would lead to identity. Any photos that come into the possession of sponsors or others connected with P.R.E.S are confidential and may not be published in any form or through any medium of communication without the express written permission of the parent, elder, AND, if a child, the child in question if he/she is old enough to understand and give permission. Names and demographic information of a family or elder is given to sponsors or others on an as needed basis with the consent of the family or elders and cannot be re-released in any form without further permission. 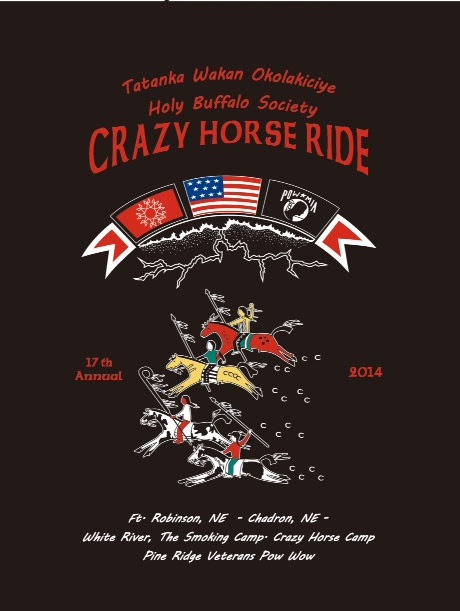 2014 Crazy Horse Ride is a celebration of the life of Lakota spiritual leader, Tasunka Witko (Crazy Horse). 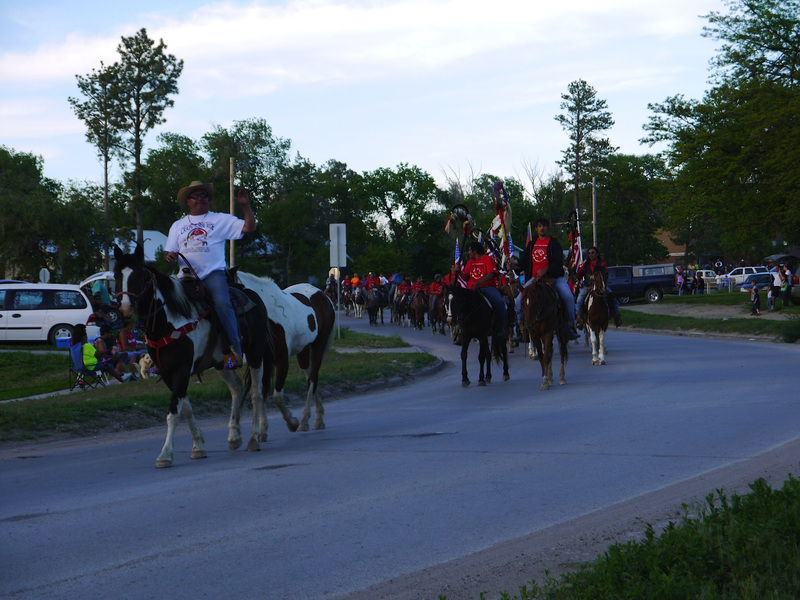 The Crazy Horse Ride begins Sunday June 1st and continues through Thursday June 5th. In previous emails we have written about the importance of this ride as a rite of passage for the youth. 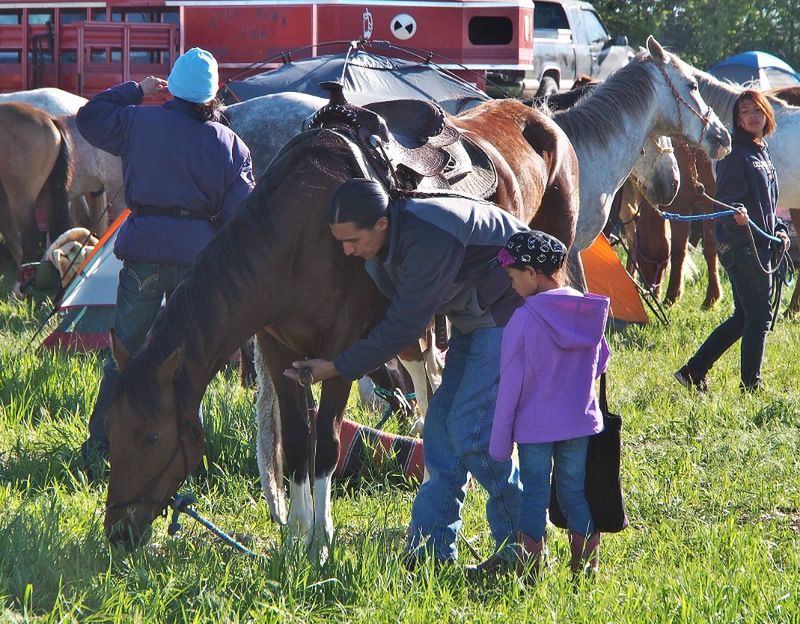 Although funding is down, the ride will still take place and Lakota Youth will have the opportunity for a spiritual experience in the tradition of their people. If you would like to help us supply the riders with food water and necessities for the riders, all donations will be used for that purpose. The email below is from Bamm as he prepares for this, the 17th annual Crazy Horse Ride. ... 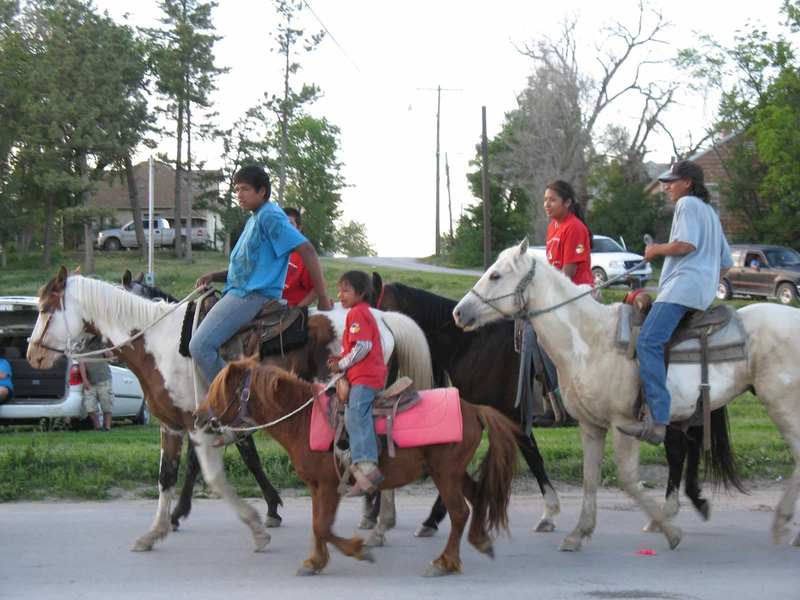 It is the specialty of many Lakota youth's lives, It is the funnest part of their summer. It is the time when they all gather their horses and ride together. One can get deeply immersed in the spirituality of the journey as I have and things get kinda touchy when you try to keep the meaning safe. An elder who rode many years on the ride and is no longer here said to me as we rode together during that second day years ago. 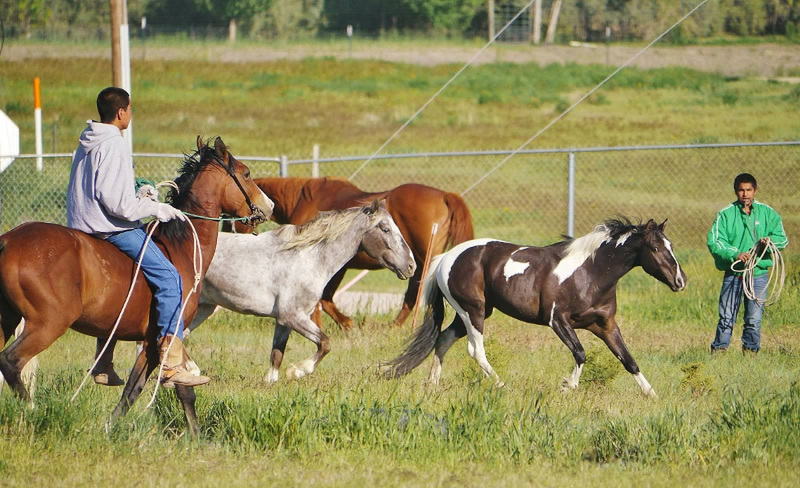 "When you get over there, those short range riders "we call "Hollywooders" will try to take this from you, you keep it and do it the same way you always do", "you do a good thing and no one would ever do it as good as you." I still remember those words today when times get frustrating, to me there is only one way to do this and that way is the way Crazy Horse would have wanted it done with respect, integrity,courage, and honor. In recent years we led a spirit horse and it was an experience that would sink me much deeper then I HAVE EVER BEEN IN THE RIDE. There I would find myself way up high in the clouds, so high that after the ride I wouldn't want to be around people I stayed far away. It would be friends who were sun dancers that would have to bring me back. Only they understood that a person could walk the earth without his spirit. It was all new to me I just came home from the ride one year and didn't even realize I was a wanderer I'll call it that. After 4 days now we go bring our spirit back in the inipi ceremony. How could this be? There is mostly kids on the ride. I wondered this and it was because they were really doing a warrior thing. So because of that it was a warrior rite of passage. It showed them a way of life, it showed them that we honor our true heroes and role models; our Veterans. So thank you all and so far so good. I'm happy just how it is and I just wanna get on and ride right now! 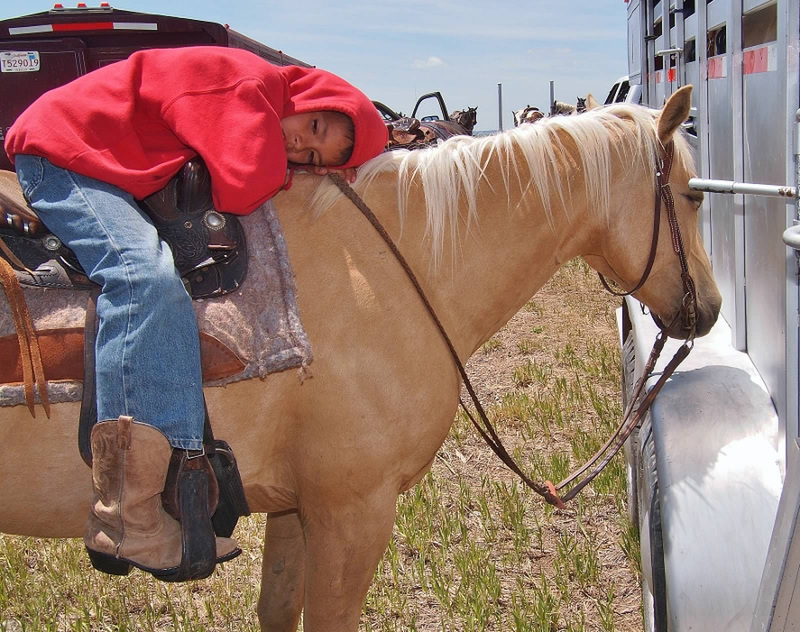 Lakota people of the Pine Ridge Reservation in South Dakota. Copyright © 2014 One Spirit, All rights reserved. You are receiving this Newsletter because you opted in via our website or by signing up for a ONE Spirit Program. 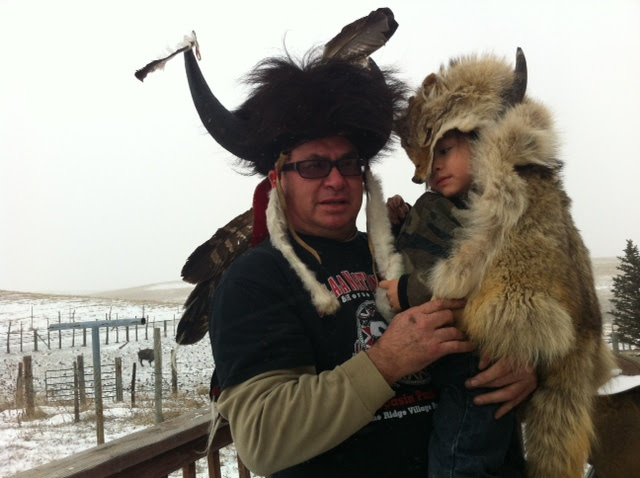 We were very lucky to meet a beautiful family on the Pine Ridge Reservation last year while visiting. The elderly grandparents sleep in this dwelling. They said that it is warm in the winter and they had plenty of room until the grandchildren moved into it with them. 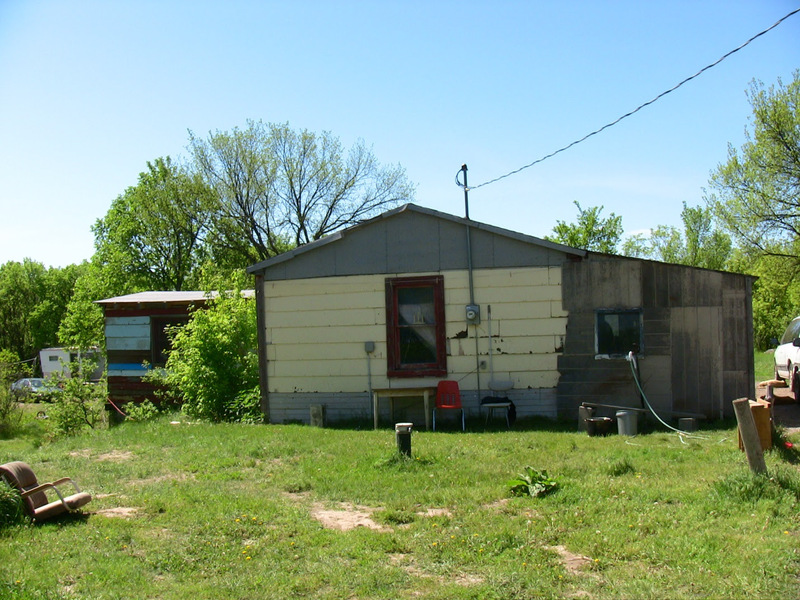 This is the rest of their home… a very typical house on the Pine Ridge Reservation. You can see they are lucky to have electricity, but there is no running water. They have to take their baths in a bucket and use an outhouse for their toilet. They have a water tank in their home that they have to have filled weekly for drinking and bathing water. There is no well or city supplied water source. These are the children that live in the home, along with their parents and grandparents. Like most children around strangers, they were a little shy when we arrived, but soon warmed up to us and posed for pictures. 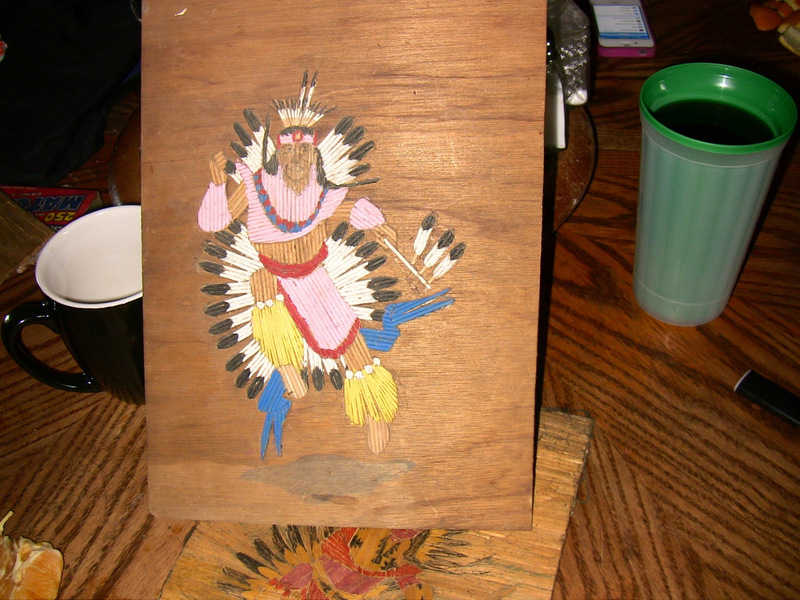 The grandfather in this home makes these art pieces out of matchsticks to sell. 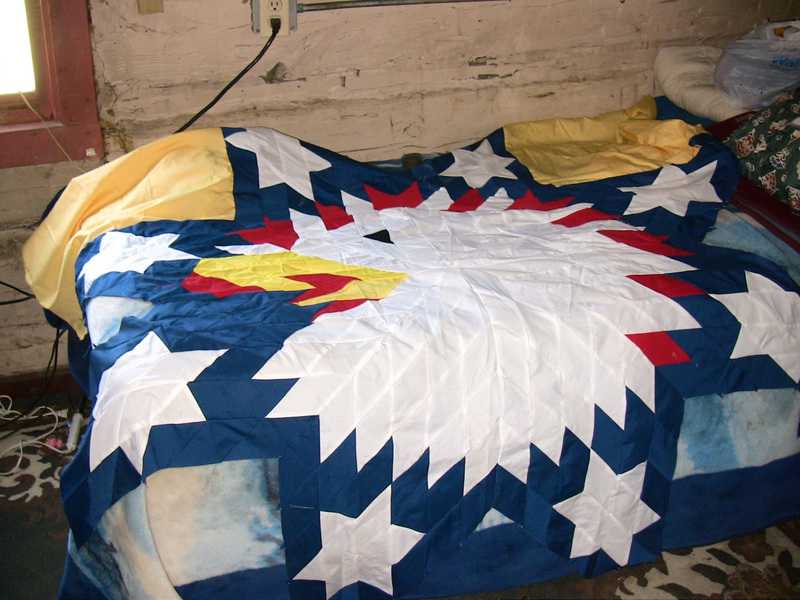 The mother makes beautiful quilts to sell and their father makes and sells his beadwork. 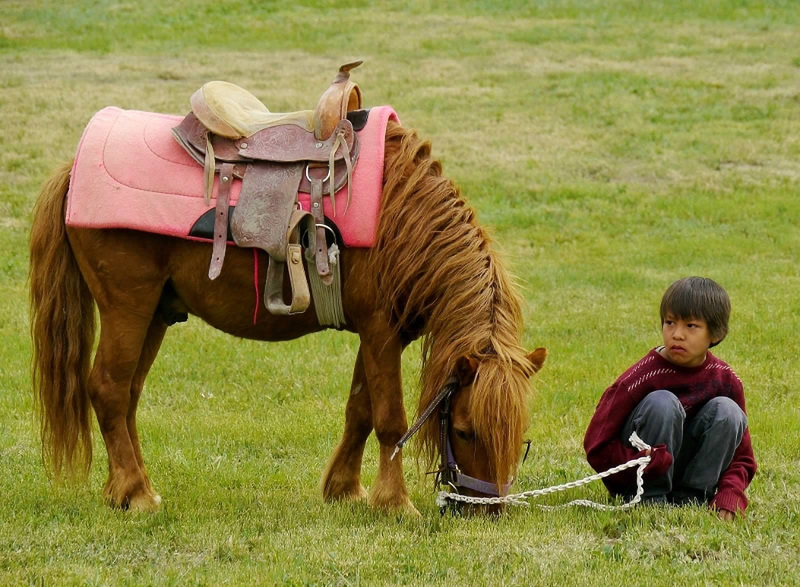 They are traditional Lakota and earn their meager income as many Lakota have before them. 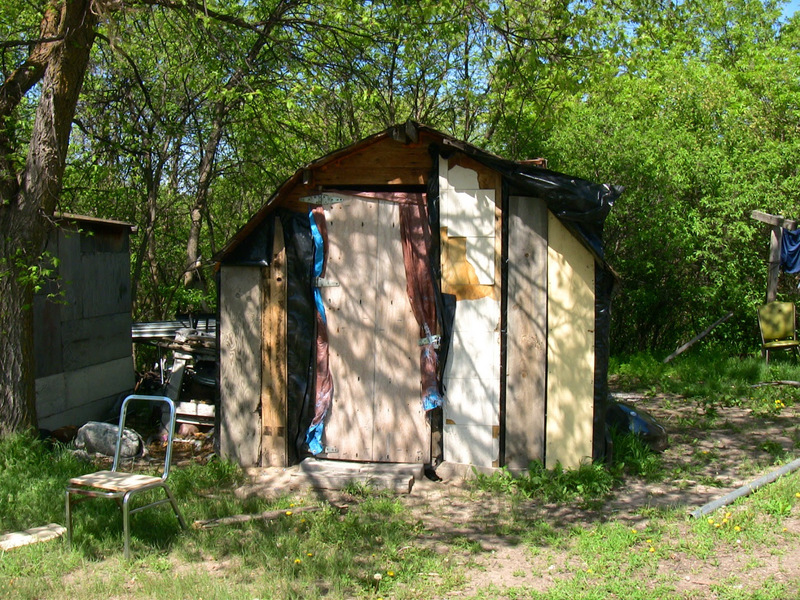 They have a sweat lodge on their property for their inipis, and live their lives walking the “Good Red Road”. But as you can see, they still struggle. We took these photos with their permission; this is a typical scenario in all of the districts and their struggle is a common thread among the many families that are helped by One Spirit. Families like this are why we do what we do. The Okini List helps families like this receive necessities to tide them over until a sponsor can be found. The Sponsorship Programs directly help a family, elder or child with clothing, hygiene products, cleaning supplies, and food. The End Hunger Campaign brings a box of fresh meat and produce to families like this, struggling to make ends meet. The Wood Program delivers a load of wood for home heat to elders and provides a source of income for Lakota woodsmen. The Youth Program supports several yearly rides, running events and the soon to be built, Allen Youth Center. As an Area Service Coordinator, this is a sample of the kinds of questions I am asked about becoming a One Spirit Sponsor. I wanted to share these questions and answers with our many supporters. Q: Do I have to be a bazillionaire to be a sponsor? A: Pffffttt! Heck no! Most of our One Spirit Sponsors are just ordinary, hard -working people. Many of them have known what it is like to have nothing, and so have compassion for others in that position. Q: How could I ever pick just one person to sponsor out of the hundreds that need a sponsor? A: Well that’s easy! If you are interested in sponsoring someone, you will be referred to a service coordinator who will do the choosing for you and will probably choose whoever has been waiting the longest for a sponsor. If you have preferences, say you prefer sponsoring a young boy or an elder grandmother, those are taken in to consideration so that you are matched with someone in that demographic. Q: Well I sent items to someone on the Okini list once. Does that make me a sponsor? A: Not exactly, but it does make you an Okini Donor! All of the families listed on Okini are waiting for a sponsor and we use the list to try to help with their immediate needs until a sponsor can be found. Many people who donate to the Okini list have ended up becoming sponsors and have chosen people from the list. But, the Okini list is just a very small sample of the hundreds of families who have asked One Spirit for sponsorship help. Q: So, exactly what steps do I take to become a sponsor? A: Also easy! You just contact us at: programs@nativeprogress.org and we will send you a Sponsor Contact Information sheet and a FAQ sheet. Once you have filled out your contact information and returned it to Kari, she will pass your information on to a One Spirit Service Coordinator, who will match you up with a Lakota elder, family or child. You will then receive the sponsoree’s contact info and can become acquainted with your new family! Last year, a 4 year old Lakota boy was put in Early Interventionbecause his language skills were lagging behind. He’s made wonderful progress and is now talking non-stop to everyone who will listen. He is the youngest in a large family, who is not always able to provide him with the clothing he needs or gifts for his Birthday or for the Holiday season. He loves dinosaurs, cars, and ninjas, and his family hopes a sponsor can be found to help with his basic needs. As a 6th grader, this Lakota girlLOVES school and loves to learn about everything. Her favorite subjects are math, language arts, and the Lakota language. She also loves sports and her favorites are volley ball and basketball. She lives with her grandmother, who has many grandchildren to care for and is hoping for a sponsor to be able to help her with her basic needs, such as clothing and school supplies when the time comes. This 15 year Lakota girl has asked for a sponsor’s help. Math is her favorite subject in school and she is very good at it. She also plays basketball, loves all sports, listens to music and is a happy, laughing child…always upbeat. She is one of 9 children in the home and knows that her grandmother struggles to provide for them all, so she is hoping to receive a sponsor to help ease the burden on her unci. Discover our partner page, One Spirit. 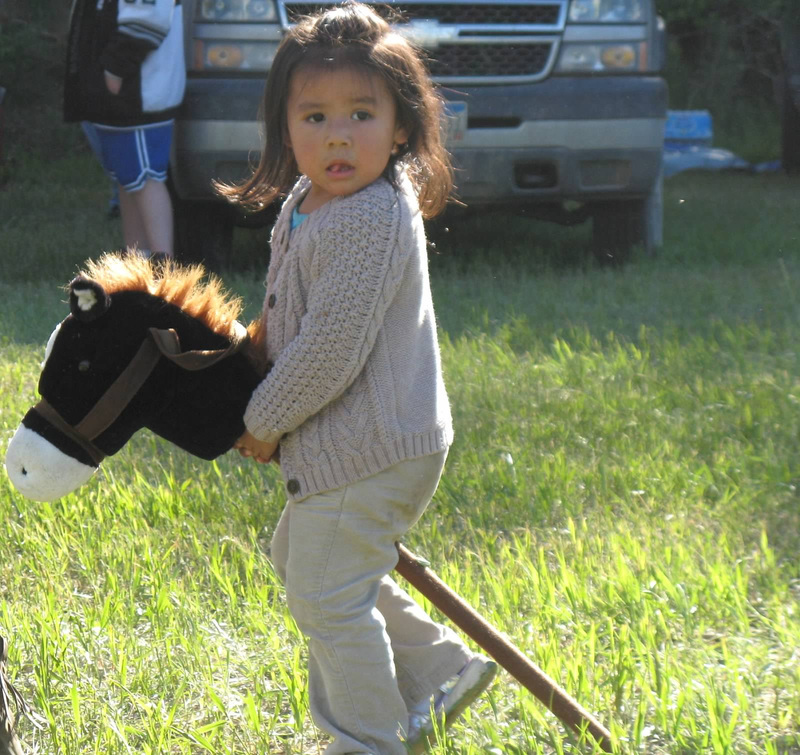 We support programs to youth and families in the Lakota Pine Ridge Reservation. During the recent trip to New York City, Team One Spirit personified the Lakota values of courage, generosity, honesty, and wisdom. During the recent trip to New York City, Team One Spirit personified the Lakota values of courage, generosity, honesty, and wisdom. During the entire trip, these young people handled the intense media attention with grace and wisdom. They were knowledgeable about the world of running and also fully focused on the goal of being the kind of role model needed by the youth on the reservation. They spoke passionately about the needs of the youth for youth centers, for academic and sports programs, and for a reason to believe that dreams can come true. This was particularly amazing when the needs they spoke of, clearly applied to their own children and families. Several members of the team live with their spouses and children in small houses occupied by 10-20 people at any one time. Even before the Marathon was cancelled due to the devastation caused by Hurricane Sandy, this team was asking how they could help with relief efforts for New Yorkers. Their goal to raise funds for the youth on the reservation, was momentarily set aside. 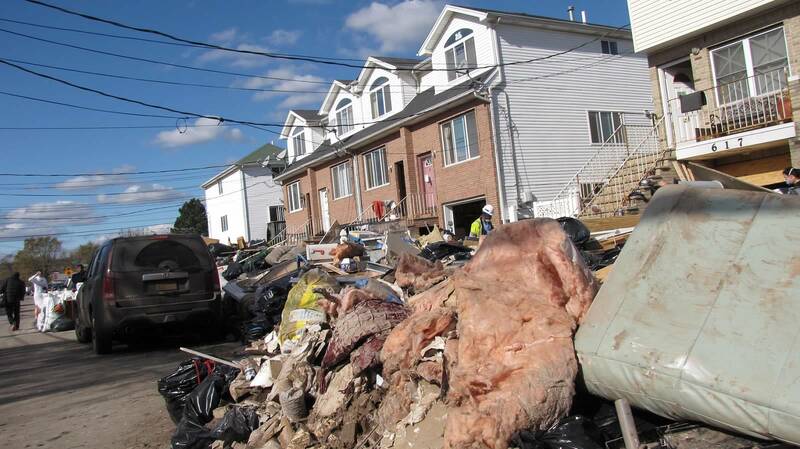 When the race was cancelled, Team One Spirit spent the Sunday race day working in Staten Island, New York in one of the areas most damaged by the hurricane. The parallels of the post hurricane conditions they found in NY and the conditions in which so many live on the reservation was not lost on them. Having lived with these conditions, they knew exactly what to provide for the hurricane victims that would be of the most help. Team One Spirit wants to begin immediately to develop running programs on the reservation and it is the goal of One Spirit to do everything possible to support that goal. We salute the entire Team: the runners Nupa White Plume, Alex Wilson, Amanda Carlow, Kelsey Good Lance, and Jeff Turning Heart Jr., their coach Dale Pine and the manager Bamm Brewer. This team brought honor to the Lakota people and fully demonstrated the Spirit of the New Warrior. Support their goal. Let's build that youth center. A trip across the country with dreams of running the ING New York City Marathon turned into a Run for Recovery for Team One Spirit. The five Lakota rnners, Amanda Carlow, Kelsey Good Lance, Nupa White Plume, Alex Wilson, and Jeff Turning Heart, Jr., and Coach Dale Pine found themselves welcomed participants and honored guests of the New York Road Runners, even after the event was canceled at the last minute due to Hurricane Sandy. The whole journey was a great experience for Team One Spirit. On the plane trip to New York City with stops along the way at different airports, news updates created doubts if the marathon would even take place. The coverage of Hurricane Sandy brought a realization into focus for the runners, but as far as everyone knew, the race was still on. Team One Spirit, along with thousands of other runners from all over the world, traveled on into the city. After their arrival, the Lakota runners had a first-class invitation to media day, a very special event with only world-class elite runners being interviewed. The runners got the chance to sit among the sport’s great champions and meet them. It was then that the reality actually set in as to the seriousness of what they were about to do. Elite runners such as Olympic marathon runner Meb Keflezighi shook hands with all the Team One Spirit members and said “I watched your video and it was very interesting.” He then said, “Don’t be scared.” All the runners got a good kick out of that one. Team One Spirit received plenty of media attention of their own. The New York Daily had already met with the crew weeks before their journey to New York City. Wayne Coffey made a special trip to Pine Ridge to interview the team and his story came out the day of the race that turned out to be the day of helping hurricane victims. On media day, there was a photo session at the finish line area with Team One Spirit. One very special highlight for the team had to be the Broadway interview by the New York Road Runners. It was right in the middle of all those bright lights with the New Year’s ball high above. The team was treated with great hospitality and felt like celebrities and they were truly a centerpiece of that night on Broadway. 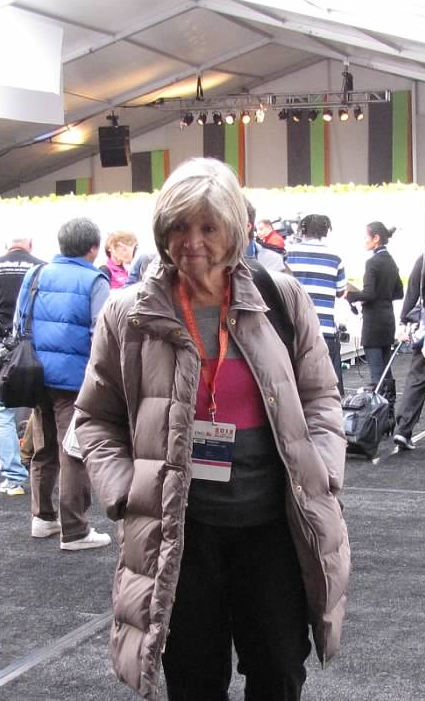 It was the second day in New York that would bring the news of the cancellation of the marathon. 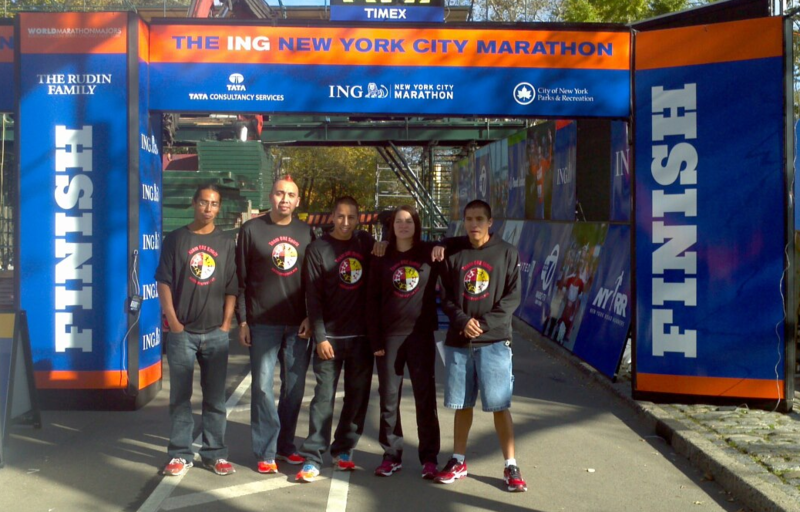 The team had actually received their bibs, their ING New York City Marathon numbers, and a special shirt and were registered runners. It was official; they were in. But after a cross-town stroll back to the Hotel Manhattan, the news of the big cancellation reached Team One Spirit. The last-minute cancellation gave everyone a first-hand look at the seriousness of Super Storm Sandy. Coach Dale Pine had wondered if they would even run the event at all, so his gut instincts were on target. The news was a shock, but it didn’t take the team long to realize there was another purpose in New York for them. They made plans to visit the most hurricane-devastated area and help with the clean-up. 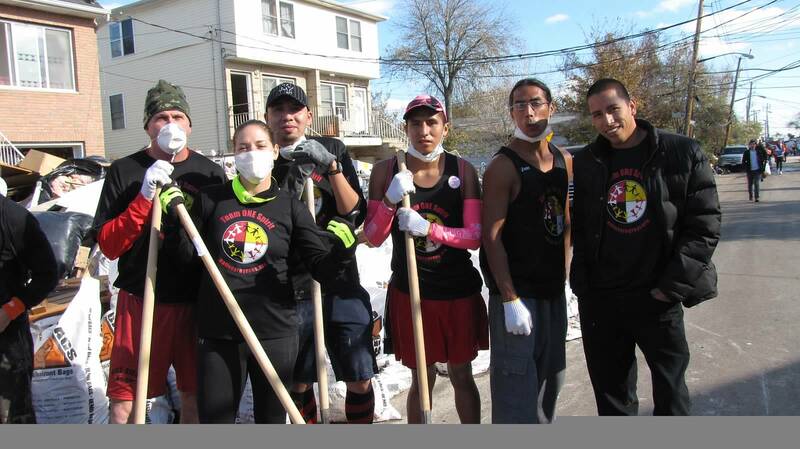 A “Run for Recovery” was organized by New York runners and the Lakota were going to be participants. It was a showing of support for the victims of Hurricane Sandy. The project would bring them to the Staten Island area, where the impact could be seen first-hand and up close. It was a sight that would bring out the true heart of Team One Spirit and the many other runners who participated in the Run for Recovery. “Our mission was completed” said Amanda Carlow. 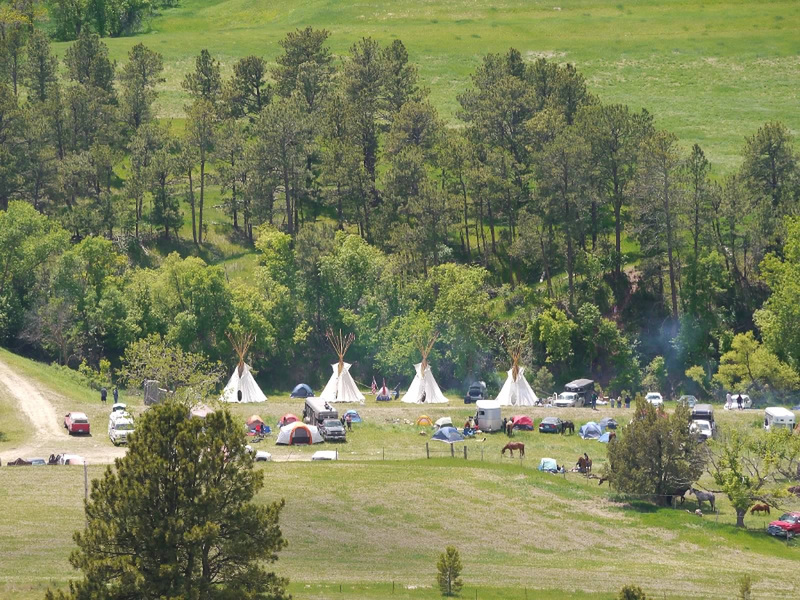 The intention of the trip was to draw awareness to projects on Pine Ridge Reservation and in the long run get some interested sponsors to help with reservation projects. One such project is a youth center near the Allen community within the reservation. Instead, the trip turned into a relief effort for New York City residents. This drew out a great feeling of pride, and to be able to travel all the way to New York and then instead be helping the city and community was truly special for Team One Spirit. In other views of the trip, Coach Dale Pine said, “It left a lot of questions unanswered, we wanted to be able to run the course and see how our runners would do.” Nupa White Plume enjoyed his time in New York. With a surprised look on his face and a big smile, he looked up at the big sky scrapers saying, “I still can’t believe we were going to do this and we are here.” It was a big step for Nupa; he had a really hard time leaving his children and family back home. Nupa definitely would have done well, as he trained very hard for the marathon. Alex Wilson of Pine Ridge High School can be proud; the past State Champion had his sights set on a great finish and that is really what they all got. Jeff Turning Heart, Jr. met his teammates for the first time when everybody arrived in New York. He was a great scout from the Cheyenne River Oyate. Kelsey Good Lance liked his trip to New York City so much that he wanted to stay and help out longer and the other team members almost had to drag him away. Amongst the runners, Amanda Carlow was the team leader in the big city. She had traveled before and provided a leadership role for the crew in unfamiliar surroundings. Amanda was also our team tech; with her cool little talking cell phone, she kept everyone from getting lost. The last night of the trip she came up with an idea. There was a homeless lady sitting down the block from the hotel who was holding a “Need Help” sign. Amanda took all the runners to her and they gave her food and some words of encouragement. Amanda is the Red Cloud Middle School cross country coach and this year’s varsity girls basketball coach, and she gave the school one to be proud of. Jeri Baker, Director of One Spirit, is truly loved by these runners, and what she did to put this whole thing together was above and beyond. She was with the team the entire time even though her home was without electricity, not to mention she hiked all over the city right along with the runners. 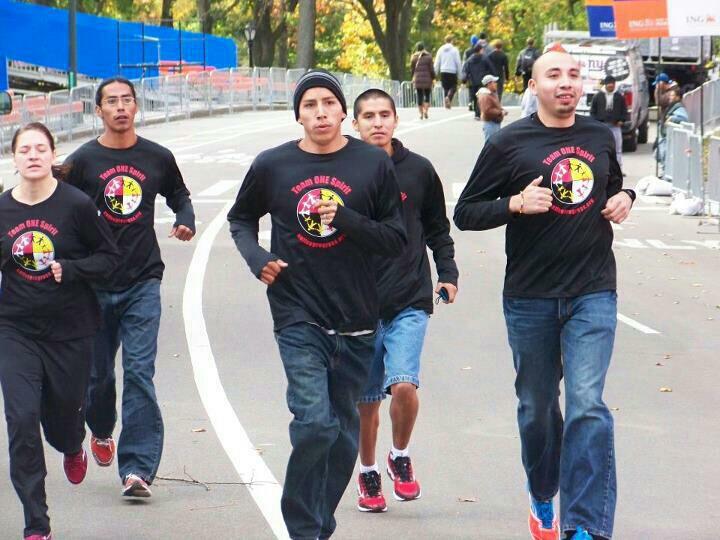 The whole Lakota Nation can be proud of these runners, Dale Pine, and the One Spirit organization, as they truly were great representatives of the oyate. The fact remains true that there was no disappointment. It was a great, fun, meaningful trip and all turned out well and the runners will have a whole year to train and prepare for another shot at the One Spirit dream of becoming the first Lakota team to run in the ING New York City Marathon. The team is thankful to Jeri Baker and One Spirit, Jerry Evans, Jeff Harris, The New York Road Runners, OST Finance, and Andersons Clothing of Chadron, Nebraska.